Every year, on 9 June, archivists all around the world celebrate International Archives Day to raise awareness about the role of archives in collecting, preserving and sharing humanity’s heritage. This year, at EMBL, 9 June also marks six weeks until the inauguration of the EMBL Archive. This will be held on 19 July at EMBL’s Heidelberg site. 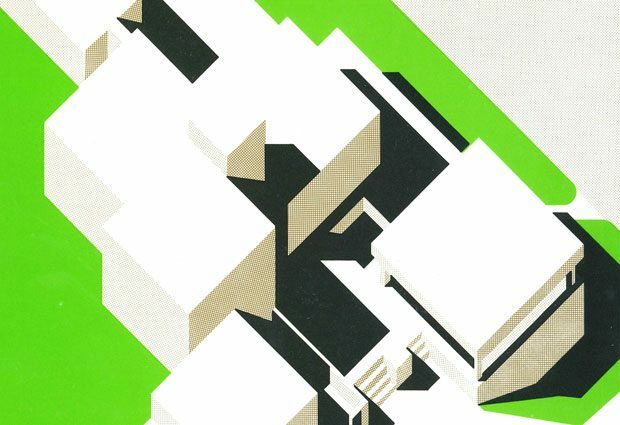 The EMBL Archive is a new resource, which captures, preserves and makes available scientific and institutional material from EMBL’s past and present for the future. 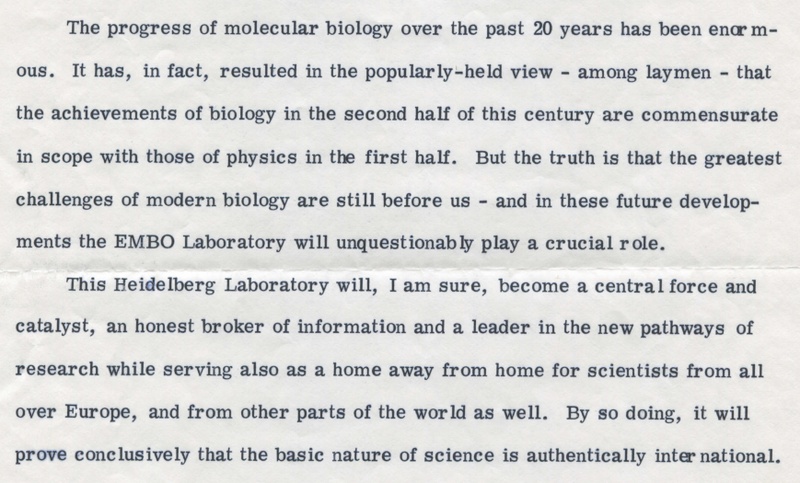 Ahead of the inauguration, here is a preview of some material from EMBL’s past. We will reveal one item a week until the inauguration and explain how it connects to the present and future of European molecular biology – so stay tuned! 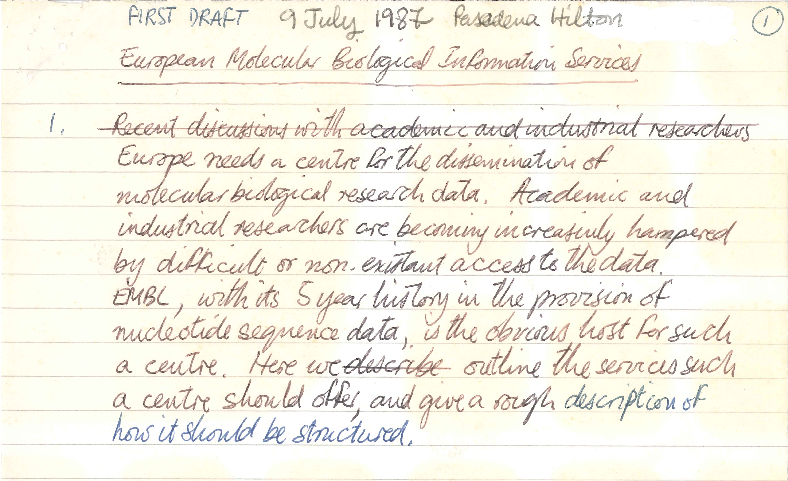 May 1978, EMBL’s first site, the headquarters in Heidelberg, was officially opened with an inauguration ceremony. At that event, immunologist Michael Sela gave a speech on science and international collaboration. His message still rings true today: “the basic nature of science is authentically international”. 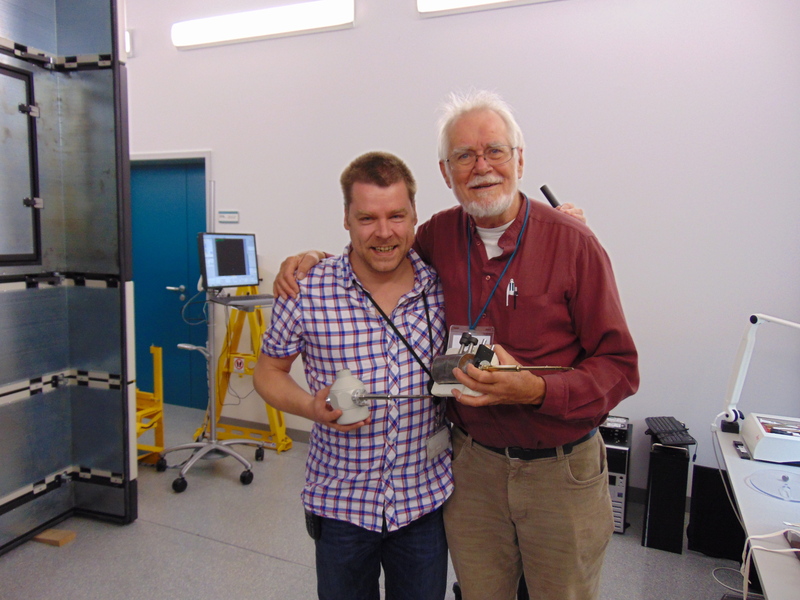 That is something that has been ingrained in EMBL’s very foundations. From 10 member states when it was founded in 1974, EMBL today has over 20 member states. Scientists from these countries can access all EMBL services and programmes. Member states are also responsible for all important decisions about the organisation and its activities. EMBL is now made up of over 1700 people from over 80 countries worldwide working across six sites. Over 7000 people travel each year to one of EMBL’s courses or conferences. The future of science is international and global. On 19 July 2018, at the inauguration of the EMBL Archive, Michael Sela will return to EMBL Heidelberg to give another speech. He will travel from Israel to Germany to do so. This cover, from EMBL’s 1991 Research Report (DE 2324 C-PUBS-C-16) illustrates work carried out that year to study how the inside of cells are organised. When cells divide the structures inside are dramatically altered: the chromosomes condense, the nuclear envelope fragments and microtubules reorganise and form the mitotic spindle. 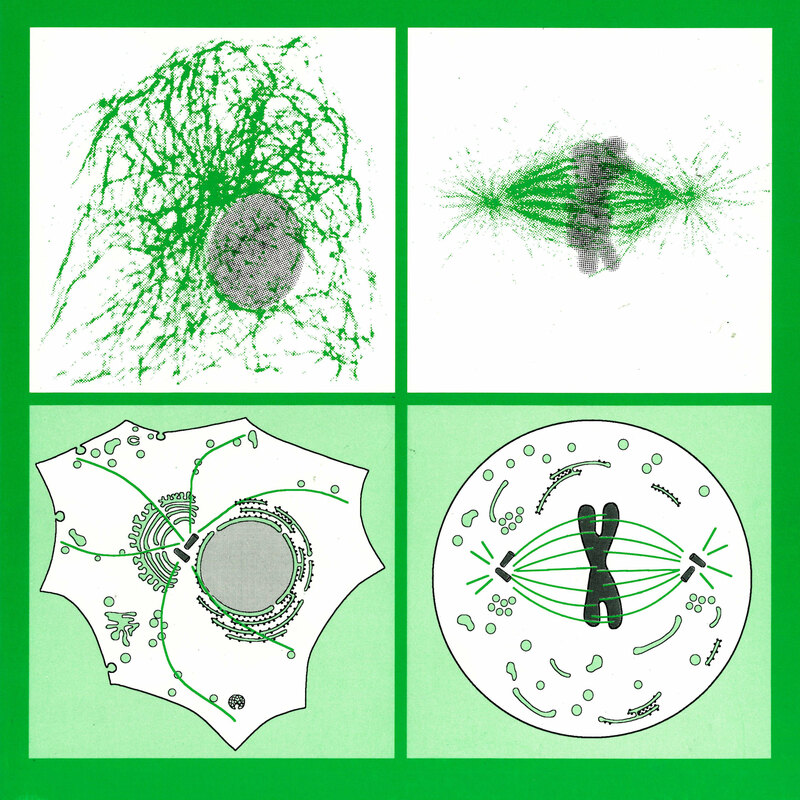 In 1991, several groups at EMBL were studying what happened cell division. In this image, the panels on the left show cells during interphase, or “normal” phase. On the right, cells during division (mitosis). The upper panels display the microtubules (green) and DNA of the chromosomes (grey) as observed after double labelling in the confocal microscope. The lower panels show a graphical representation of the cellular organelles during these processes. 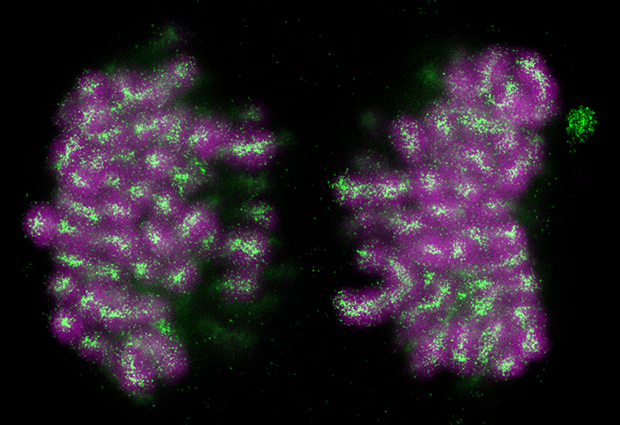 Today, in comparison, we can see individual condensin proteins bound to chromosomes during the different stages of cell division using quantitative live cell imaging, and we can even watch those condensins form. EMBL’s Research Reports were one way that EMBL made its research activities public. Later called Research at a Glance and now Research in Brief, a full history of these publications is accessible in the EMBL Archive’s “EMBL Institutional Publications” collection. 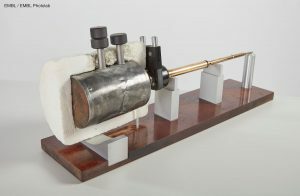 Dubochet was at EMBL from between 1978 and 1987, a period during which he worked closely with EMBL’s workshops to develop instruments, in particular a cryo-holder and a cryo-plunger that prepare samples to be put into the large electron microscope. Today, cryo-electron microscopy represents one of EMBL’s major areas of research and service provision. 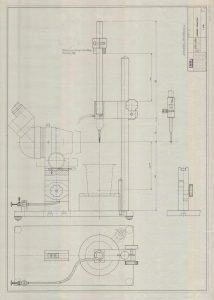 Although the equipment does look a little different today it is still recognisable from Dubochet’s work. 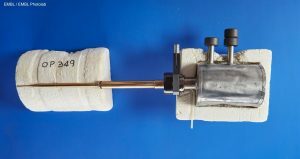 The Electron Microscopy Core Facility in Heidelberg, and the cryo-EM facility in Grenoble give users to access cutting-edge instruments and support, and EMBL scientists continue to innovate and create new techniques, such as correlative light and electron microscopy (CLEM). In the 20th century, cars in Europe could often be seen sporting oval country code stickers as they drove across borders. 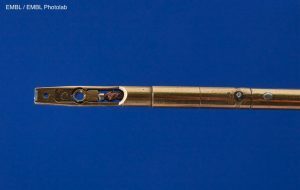 These helped distinguish cars from different countries that had similar looking registration pates. 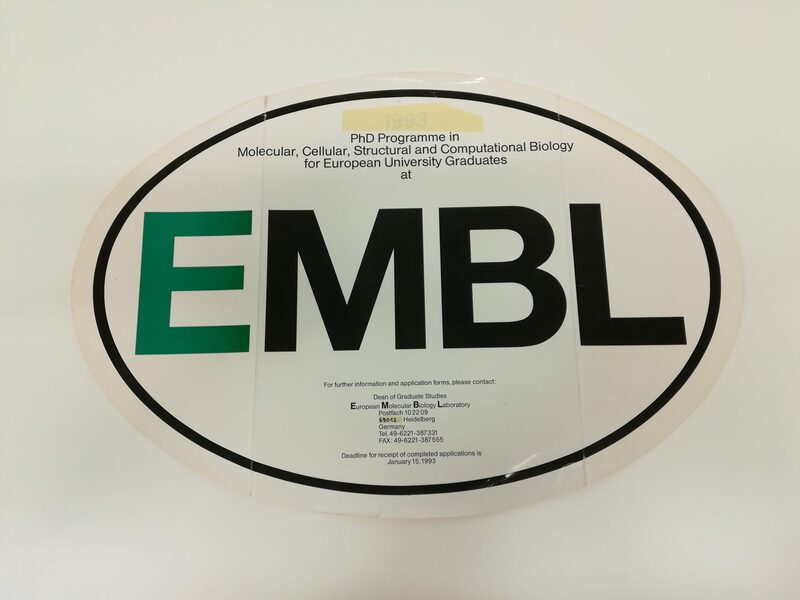 This poster, which recalls these stickers, was created to recruit the 1993 cohort of PhD students to the fictitious land of EMBL, which at that time had sites in Heidelberg, Hamburg and Grenoble. The EMBL PhD programme was launched in 1983 in collaboration with universities across Europe as part of EMBLs commitment to training. Today, EMBL welcomes about 60 new PhD students each year, with recruitment calls for the PhD programme each spring and autumn. Next week, potential predoctoral fellows (we call them predocs) will start visiting one of the six EMBL sites for interviews, that’s three more sites than back when this poster was made. The EMBL Archive is collecting different facets of EMBL’s training activities including material that is produced and/or received, from or by any of the EMBL sites, in the course of delivering training. This will be developed throughout the years. EMBL’s European Bioinformatics Institute (EMBL-EBI) in the UK, makes biological data available to scientists all over the world, provides training and performs basic research in bioinformatics. Its data centre stores some 120 petabytes of data and receives more than 27 million requests through its websites every day. Back in the 1980s, however, EMBL’s first databases were sent on magnetic tape through the post. Today, EMBL continues to promote open access to data and research. EMBL’s “Open Access Policy” also helps ensure that EMBL’s scientific outputs are available not only for reading, but also for reuse. A bioinformatics timeline, prepared in 2014 on the occasion of EMBL-EBI’s 20th anniversary celebrations. The letter from which the quote above comes from is at the Historical Society of Pennsylvania. The quote features on this poster, which is part one of a series of posters collected in Heidelberg during the 2017 March for Science. Science operates within society, it is part of it. 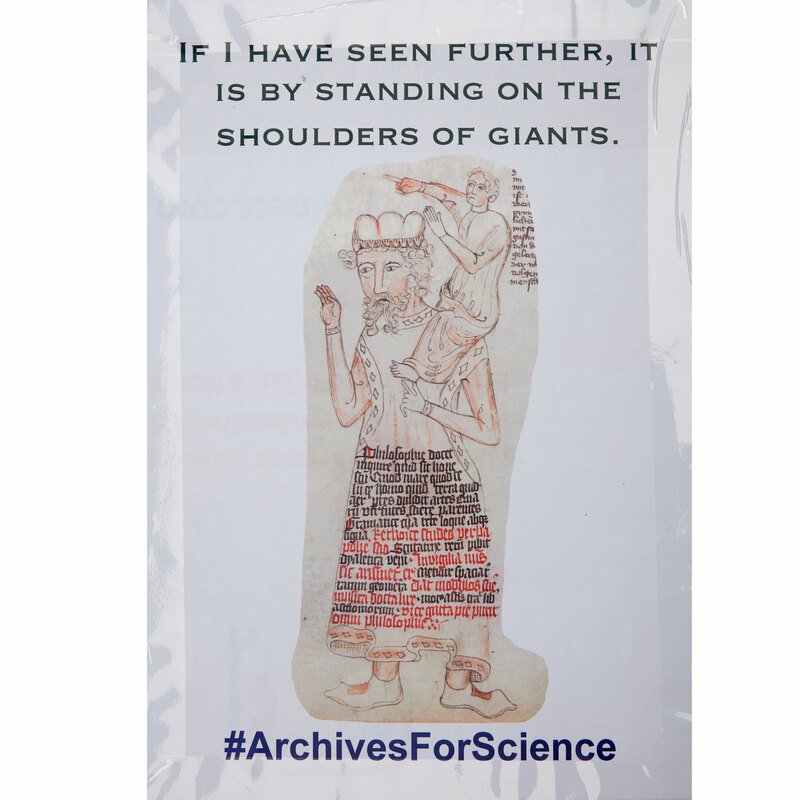 The archives of science are the records of one of humanity’s greatest sagas and I believe access to the scientific record is what allows science to advance, every day, for the benefit of all of society. That is why the EMBL Archive is committed to supporting scientists and EMBL in capturing, preserving and making accessible EMBL’s stories.